A mechanical cage transporting a frightened teenager penetrates the surface of a grassy field, and the figure inside is immediately swarmed by curious onlookers. He has arrived in “the Glade” just like all those before him have done: with amnesia and anxiety, lacking awareness of the reality and yet alarmed by the rhythmic familiarity it seems to instigate in others. It is a routine that has followed the residents of this isolated civilization of young boys for well over three years: every 30 days, someone new arrives, and always it is a young man who remembers little beyond his given name (“It’s the only thing they let us keep”). Their witless imprisonment is contrasted by what surrounds their enclosed reality: a giant maze with walls as high as the sky, which looms as if beckoning would-be adventurers while inspiring a fear of great depths. Each day, a gate opens and offers them entry; every night it closes, and those caught inside are devoured by creatures referred to as the “Grievers.” It is a pattern that that has followed them for as long as they remember, and they no longer question or resist it. But things will change for them with the arrival of this particular individual. They have to, otherwise there wouldn't have been reason to make him the focus of an entire movie. There are roughly 5 dozen teenage boys that populate the busy frames of “The Maze Runner,” and all of them share an unspoken commonality that becomes the driving influence of the plot: they have searched for an escape from their prison over countless moons, and the arrival of Thomas (Dylan O’Brien), who possesses unrelenting curiosity, seems to suggest a radical shift in the winds. For some, that possibility is inspiring; for others – like the morose and cynical Gally (Will Poulter) – it reeks of foolish naivety. In periodic increments, we are reminded that endless attempts have already been made to find victory here, but the impossibility of the situation has buried itself in the faces and postures of the more seasoned inhabitants; collectively, they have turned their energy to building a peaceful society of huts and establishments scattered amongst clusters of trees, all while a small unit of “runners” continue to map out the maze day after day in some dogged attempt to actually find an outlet on the other side. The formula, of course, demands that these kids must have overlooked more obvious possibilities. Who are the Grievers, for instance, other than fearsome creatures that they only speak of in hurried hushes? Do they bother wondering those possibilities beyond the inevitable reality that they consume all those who get caught in the maze? Is it possible to kill one? When Thomas observes in a heated moment of verbal contest that “it’s time we find out what we are up against,” there is almost a feeling of frustration that overwhelms us. Why? Because there is never a sense that anyone was willing to ask such questions in the three years prior to the opening of this film; no, not even by Alby (Aml Ameen), the longest living survivor of the Glade, who is looked upon by his consorts as the lone Beacon of wisdom informing all the actions of those around him. Surely, in the ongoing advancement of knowledge in how the maze functions – we are even told it actually resets itself every night, kind of like the metropolis in “Dark City” – there must have been other opportunities for these kids to consider before now. Alas, continuing the tradition of most modern young adult fables, here is yet another movie content to assume that the male gender is slow to grasp obvious realizations. All of this reflected in the faces of actors that not only appear out of step with plausible focus, but seem surrendered to the notion of going through the motions on an inevitable journey towards pain and death. 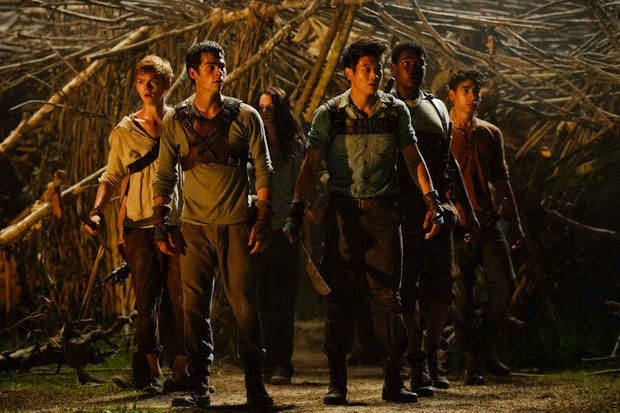 The lone act that stirs some semblance of excitement in them comes halfway into the film, after Thomas, in a mad act of rebellion, dashes into the maze upon the realization that Alby and his close consort, Minho (Ki Hong Lee), will be trapped inside, and ultimately devoured by those legendary Grievers. The subsequent scenes rewrite the trend of the Glade’s citizens in order to advance the story towards a platform of obligatory twists and turns, and the most notable of them comes when a girl named Teresa (Kaya Scodelario) arrives on the surface just three days after Thomas has. In her hand is a note that suggests harrowing consequences to recent events: “she is the last one.” But what propelled those behind the scenes to offer a woman this time instead of a man, which has been the ongoing trend? Did it have something to do with the fact that Thomas and his two friends were the first ones to actually survive an entire night locked in the maze? Or does it all come down to the fact that Thomas killed one of the Grievers? “The Maze Runner” is a grim, unsettling and merciless exercise in fatalism, a movie so utterly joyless that it makes all recent fantasies about young adults trapped in shattered worlds – including “The Hunger Games” – look like excursions through Mr. Roger’s Neighborhood. The most descriptive accounts of the premise would not begin to cover the depths of the movie’s tragic trajectory, either; those fortunate enough to make it all the way through to the climax will no doubt marvel at how such dark ideas managed to worm their way into something clearly intended for younger viewers, not to mention how they even inspired a series of books which are used as a foundation. Some of that might have been ok if the movie was not so seemingly preoccupied with mimicking style or technique from more famous filmmakers, but it is obsessed with such impulses. There is not a single original thought here thematically or visually, and almost all attempts made at establishing a cohesive direction are intercepted by moments that carry an overpowering sense of déjà vu, indeed because they have all been seen before in some more direct capacity. Consider the more obvious links, if you will. There is, among other things: a gathering of morose individuals that co-exist with those of a different world by respecting boundaries before an impending task changes the rules (“The Village”); an overpowering structure that changes shape each night to throw off the pattern of wanderers (“Dark City”); an elaborate chase in a sizeable maze that inspires uncertainty in a climax (“The Shining”); the use of a slimy substance to suggest the presence of a bloodthirsty creature lurking in the shadows (“Alien”); the silent implication that these teenagers are actually victims of an elaborate man-made test that reduces them to unwilling lab rats (“Cabin in the Woods”); and a character who is “stung” by one of the “Grievers” that becomes instantly possessed by some insatiable bloodlust that turns his eyes red (“28 Days Later”). In the age of cinematic sensibility that almost expects new filmmakers to delve into a little plagiarism, here is a movie that is intoxicated by such a thought process. 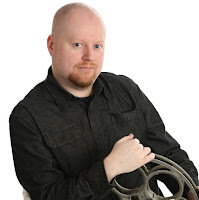 That makes it almost amusing, in some roundabout way – alluring in the sense that it does at least test one’s cinematic memory bank, and inspires us to watch on with some vested interest in looking for additional source extractions. The production design and visual effects are, to their credit, top-notch. I liked the idea that the “Glade” is nothing more than just a square patch of land surrounded by a circular maze, and the maze walls itself are towering cement structures obscured by clusters of ivy and vegetation. The camera interacts with these locales as if in awe of what it sees, and when it wanders inevitably into the path of the Grievers themselves – which are done well, too – it does not bury their characteristics beneath harsh darkness. The pitfall of the creature formula (be it in a more direct “creature feature” or otherwise) is that few filmmakers really want us to see the details, no doubt because their budgets don’t allow for them; that often explains the reason why most of said films take place entirely during the night. Here, in a film that has taken great pains to show off some semblance of ambition (misguided or otherwise), we do not walk away feeling as if we missed part of the big visual picture. The ending plays like a violation of literary conduct. Inevitably, a handful of characters will persevere against the odds and discover that there is, indeed, an end to their imprisonment waiting at the end of a long and exhausting journey through the narrow passageways of this expansive maze, but what is it that waits for them on the other side of the wall? You guessed it: a reality even darker than what dwelled within (yet necessary, I suspect, in setting up sequels). What a tiresome thing it must be to be a teenager coming to the end of a long dance with death, only to find out that there’s even more dangers lurking just beyond the next door. That this story possesses the conviction to do anything beyond leaving us feeling abused and exhausted ought to be enough of a conviction to warrant respect, but to what purpose? A passable fantasy – literary or otherwise –should at least be a deliberation of its themes rather than an exercise of them. After “The Maze Runner” was over, I felt like the victim of a senseless crime.